Do you have a Miele washing machine? It needs regular maintenance, and minor malfunctions can take place if you use it incorrectly, or not carefully. The washer stopped working for some reason? Don’t rush to call a third-party service center. There’s a possibility to fix the issues totally for free. If your washer is new and still covered by the official warranty, you can ask for the help of Miele service center. However, it will take pretty much time – a couple of weeks or so. Why wait? Fix the issues on your own! Below, you can see the repair and maintenance instructions for different models of Miele washing machines. They are present in the form of tables for your convenience: they enlist the most widespread technical issues, causes of malfunctions, and ways to fix them. Using such instruction you can repair your washing machine within minutes without anyone’s help. Besides, the tables also include the error codes. Whenever your washing machine is out of service and displays a code on the screen, you will be able to identify the problem easily by checking for the problem in these instructions. If your washer model isn’t present on the page, keep in mind that washers from one series usually have the same error code set. The instructions are made for an average user: most likely, you will be able to repair the appliance without any technical skills. The buzzer sounds and the Check drain light flashes.”___" appears in the display. The drain outlet is blocked. Clean the drain filter and the drain pump as described in ‘Problem solving guide - Opening the drum door in the event of a blocked drain outlet and/or power failure". The drain hose has been fixed too high. The maximum drain height is 1 m.
The buzzer sounds and the Check inlet light flashes. "___" appears in the display. The water inlet is blocked. Open the stopcock. The buzzer sounds and the Check inlet and Check drain lights are flashing. "___" appears in the display. The water protection system has reacted. Call the Service Department. The buzzer sounds and the Soak/Pre-wash or Rinses indicator light is flashing. "___" appears in the display. There is a fault. Start the programme again. If the fault indicator occurs again, contact the Service Department. - Opening the drum door in the event of a blocked drain outlet and/or power failure. - the stopcock is opened wide enough. - the inlet hose is kinked. The filter in the water inlet hose is dirty. Clean the filter. The Excess detergent check light comes on. Excessive foam has built up during washing. Use less detergent next time and follow the manufacturer's instructions on dosage given on the packaging. The Main wash indicator light is flashing. There is a fault. Start the programme again. If the fault indicator occurs again, contact the Service Department. The Check drain light flashes. The drain outlet is restricted. Clean the drain filter and the drain pump - Opening the drum door in the event of a blocked drain outlet and/or power failure". The Anti-crease/Finish indicator light is flashing. The position of the programme selector was altered after the start of the programme. Turn the programme selector back to the programme previously chosen. DRAIN/FILL warning light flashes ■ Check that both water intake hoses are connected to the water supply and that the valves are turned on. ■ Check if inlet water filters are clogged. ■ Check the drain hoses. They should be no higher than 3 feet (1 m) from the base level of the washer/disinfector. The inner diameter of the hoses should be no less then 3/4"
■ Check if any hoses are kinked. If so, straighten. ■ Activate DRAIN cycle. Once DRAIN is complete, restart processing cycle. The REACTIVATION light is on ■ Replenish the water softener. The DETERGENT light is on ■ The liquid detergent container has to be refilled. The NEUTRALIZER light is on ■ The neutralizer container has to be refilled. The display shows two dashes ■ Contact the Miele Technical Service Department. The washer/disinfector must be reset by a trained technician. The "FAULT" indicator "Drain" lights at the end of a program. The drain is blocked. Clean the drain filter and the drain pump. - To turn off the fault message: Open the drum door or press and hold the "Pause/Hold to Cancel" button until the fault message goes out. The "FAULT" indicator "Intake" lights at the end of a program. The water intake is blocked. Possible fault: Check if the water supply is open all the way. The "FAULT" indicator "Over sudsing" lights at the end of a program. The machine has over sudsed. Use less detergent in the next wash program, and follow the recommended amount on the detergent packaging. The machine is not switched on. 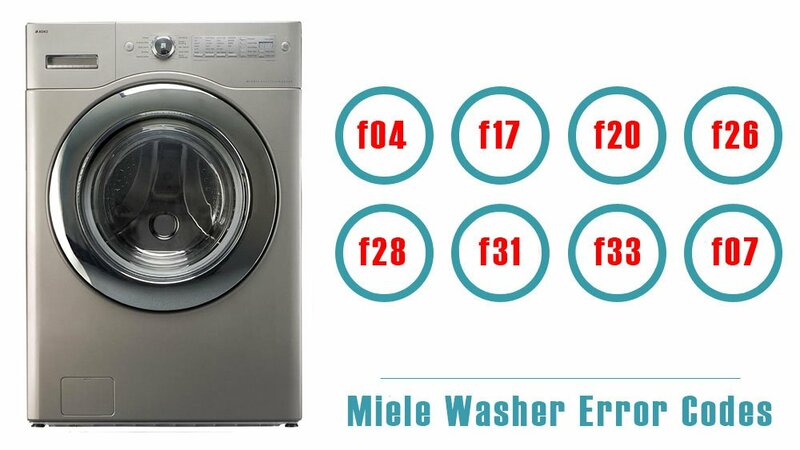 Fault code: F 04 - F 17, F 20 - F 26, F 28 - F- - Call Miele Service. Fault code: F 31 - 33 There is a fault with the controls for the dispensing system. Call the Miele Customer Contact Centre. The DOS indicator starts flashing before the start of a programme. The programme cannot be started. Fault code: Fdo: The container for liquid cleaning agent is empty. Fill the container with liquid cleaning agent or replace it with a new, full container. - Switch the machine on. - Start the programme again. Water in the wash cabinet is not heated; the programme lasts too long. Fault code: F01 - F03 F18. F19, F27 This machine has a resettable heater limiter which will switch off the heating elements if they over-heat. This could be caused, for example, by large articles covering the heating elements or if the filters in the wash cabinet are blocked. - Clean the filters in the wash cabinet. The program was canceled, the buzzer sounds and the "Start" button flashes. - To turn off the fault message: Open the drum door or press and hold the “Pause/Hold to Cancel" button until the fault message goes out. The "FAULT" indicator "Drain" lights, the buzzer sounds and the "Start" button flashes. - The drain is blocked. - Clean the drain filter and the drain pump. - The drain hose is too high. - The maximum drain pump height is 3 ft (1 m). - Check if the water supply is open all the way. The"FAULT" indicators "Intake" and "Drain" light, the buzzer sounds and the "Start" button flashes. The waterproof system has activated. Contact Technical Service. The"STATUS" indicators "Pre-Wash" and "Main Wash" light, the buzzer sounds and the "Start" button flashes. There is a fault. Start the program once more. If the fault message appears again call Technical Service. The buzzer sounds and the "Buzzer" indicator lights, the buzzer sounds and the "Start" button flashes. The door is not closed properly. - Open the door and check for any obstructions. - Press 'Pause/Hold to Cancel" for at least 5 seconds.